Elegantly simple, a half dozen roses are a delightful way to extend your heart. 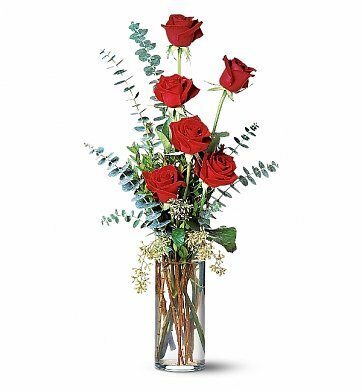 We combine six 50 cm roses in your choice of pink, red, or white in a glass vase with dramatic accents such as eucalyptus and myrtle. Six Roses (50 cm) in Your Choice of Color. Measures approximately 10" x 23". Half Dozen Classic Roses is a hand delivered gift. These gifts are delivered by one of our local design centers located throughout the United States and Canada. Same day delivery is available for most gifts when ordered before the cutoff time. The cutoff time for Half Dozen Classic Roses is in the recipient's time zone. I sent these as a birthday gift. They were a huge hit. They were just as if not more beautiful than pictures. It was good service and roses. She loved them. Thank you so much for going out of your way to get my order delivered before my girlfriend left work, even though I didnt ask until last minute. You helped me make her birthday a special one. She loved the arrangement!